In this unit you’ll develop your listening skills around the topic of age. You’ll practise listening to opinions as well as getting general and detailed information, while people discuss their attitudes to age and getting older. You’ll also be able to review ways of describing ages. 3 short monologues. Tom, Mark and Katie answer three questions about age, whilst sitting in the park. 4 short interviews. With Niall, Stuart, Chris and Jon. British speakers with a mixture of northern and southern accents, recorded outside and in people’s homes. 1 longer interview with Laura, in her house. Download All the eBooks Now! 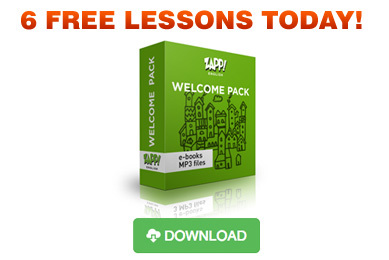 Get immediate access to all 32 audio listening classes and eBooks with the Zapp! English Listening eBook Pack, which is now available in our shop. You’ll also get some extra bonuses FREE! Visit our iTunes channel for Zapp! English Listening – Click on ‘Subscribe free’, and be the first to get our new podcasts FREE!